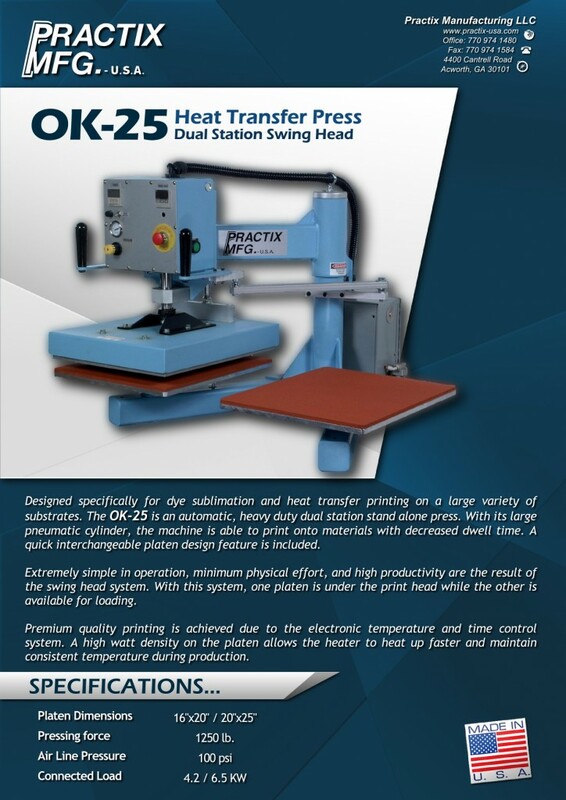 Designed specifically for dye sublimation and heat transfer printing on a large variety of substrates, the OK-25 is an automatic heavy-duty dual station tabletop press. With its large pneumatic cylinder, the machine is able to print onto materials with decreased dwell times. A quick interchangeable platen design feature is included. Extremely simple in operation, minimum physical effort, and high productivity are the result of the swing head system. With this system, one platen is under the print head while the other is available for loading. Premium quality printing is achieved due to the electronic temperature and time control system. A high watt density on the platen allows the heater to heat up faster and maintain consistent temperature during production. Simple operation and consistent color.